From the advent of moving pictures to the invention of TV, historic developments drove image technologies through the 20th century. Among them, color and high definition (HD) were two major advances. Now, we present a third breakthrough in the form of full-HD 3D.This new viewing experience is creating a new dimension of videorealism. 3D is great in the theater; bring the same amazing technology home today. Don’t get stuck in 2D when you can bring 3D right to your living room. 3D is the latest dimension in gaming, movies, and TV programming. Don’t watch TV, live it. The amazing images jump off the screen, bringing the action so close, you can almost feel it. 3D images are a made with a special camera that records one image from two perspectives. One of the images is recorded and projected for the viewer’s right eye and the other image for the left. When 3D glasses are worn, an illusion of depth as well as the image’s height and width is created. If you look at the images without the assistance of 3D glasses, the image will appear blurry. Abt carries just about everything you need to bring 3D entertainment into your home. Don’t be left in 2D. Shop Abt and bring home 3D technology today. The only way to immerse yourself in 3D is to have a 3D TV. A 3D TV isn’t the only component you will need to bring your TV to life. You will need a 3D Blu-ray player, 3D Glasses and HDMI 1.4 cables. If you love to play videogames, think of a Sony Playstation 3. You will be able to watch Blu-ray and 3D Blu-ray DVDs as well as play games in 3D. 3D has been around for decades, only now can you get a movie-quality 3D experience at home. A 3D TV can have an LED, LCD, or plasma screen. The only difference from a 2D TV is the screen is designed to show two versions of the same image. This works because the two versions are alternated at speeds that are so fast, they are undetectable by the human eye. There is a 3D TV for everyone. Because 3D technology is so new, manufacturers are giving consumers options. Most TVs are 3D-ready. What does that mean? The TV will be equipped with a 3D emitter to send signals to the 3D glasses that you will be wearing. These TVs usually do not come with 3D glasses. These TVs are made with the screens that can play a 3D image, but they lack the emitter that is necessary to project a 3D image. 3D emitters are available to purchase for these TVs and they are external additions to the TV. Similar to 3D-ready TVs, these sets are equipped with 3D emitters and the proper screen to produce a 3D image. They will usually come with 3D glasses. Abt has many options for 3D compatible Blu-ray players. You can bring 3D movies to life, in your home with a new Blu-ray player. Of course these 3D Blu-ray players also support standard Blu-ray Disc movies in high definition and upscale DVDs to near HD quality. The PS3 will be 3D compatible through a firmware upgrade sometime in 2010. That means you can watch 3D Blu-ray DVDs and play games in 3D after downloading a firmware upgrade. Most consumers are familiar with the term HDMI cable. What you may not know is there are different types of HDMI cables. Most cables in use right now are HDMI 1.1, 1.2, or 1.3. For a TV to display 3D images from a Blu-ray or PS3, you will need HDMI 1.4 cables. It is both a 3D channel and Ethernet channel. This cable will transmit all the data you will need to play a 3D Blu-ray. All HDMI cables at Abt are 100% QC tested to pass 1080P at every length and all contain the 5th twisted pair for the new Ethernet and Audio Return Channel options. Until recently, 3D glasses were plastic with one red lens and one blue. Improvements have been made on the technology; consequently the new 3D movies, TV broadcasts, and games can be viewed in 1080p, full 3D HD. 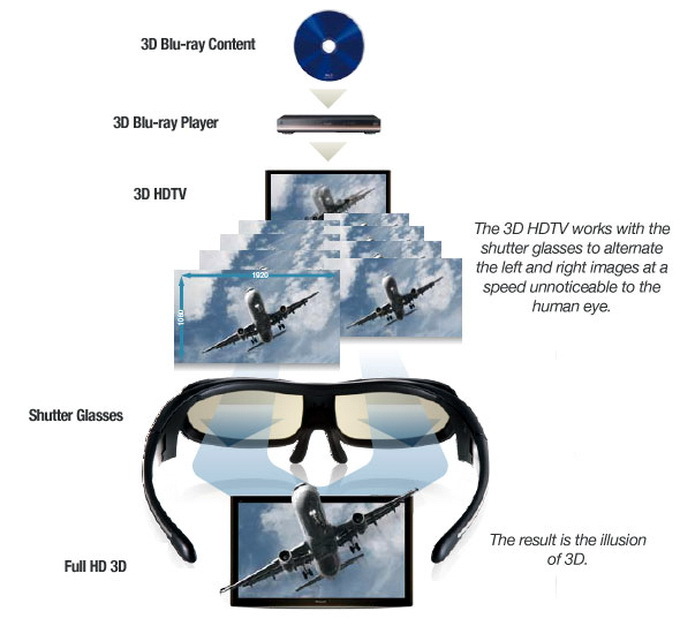 Active liquid crystal shutter glasses replace older tinted glasses to give a 1080p, full 3DHD image. Each lens alternates blocking each eye up to 120 times per second, like opening and closing a shutter, one side at a time. They link to the TV by an infrared Bluetooth signal and most use rechargeable batteries. 3D movies and animated cartoons are available on 3D Blu-ray DVDs. More than movies will be available in 3D. Both ESPN and the Discovery Channel are developing channels devoted to 3D. ESPN’s channel is slated to begin in June 2010 and the Discovery Channel late 2010/ early 2011. PS3 will also have games available in 3D with the option to be played in 2D. 3D or stereoscopic imaging is a technique capable of recording three dimensional images, which gives the illusion of image depth. 3D TV technology encompasses TV programming, movies, or games. Stereopsis is the process which allows our individual eyes to see depth in an image. One of the images is projected for the viewer’s right eye and the other image for the left. 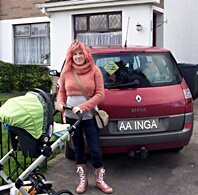 When the two images are displayed they are layered one on top of the other; one is slightly to the right and one is slightly to the left. When looking at the images without the assistance of 3D glasses, the image will appear blurry. When wearing 3D glasses, the images blend together and give the illusion of depth as well as the image’s height and width. 3D is filmed using two cameras in 1920 X 1080 full-HD. When both sets of recordings are played at the same time and overlapped, an illusion of depth is created. When you wear 3D glasses, images recorded this way will jump off the screen. Q: Do I need to buy a 3D TV to watch 3D programming, movies, or play games? A: Yes. Currently none of the traditional standard or high-definition TVs on the market can be upgraded to support the new 3D technology. You will need to buy a TV specifically made for viewing 3D TV broadcasts, movies, or playing games. There are a few 3D-compatible DLP and Plasma TVs which have been recently released by Samsung. There is no confirmation by Samsung as to whether they will be compatible with other manufacturer’s 3D sources, like 3D Blu-ray players. Mitsubishi also has a 3D adaptor box available sometime in 2010, which will be compatible with sources like Blu-ray players. The image quality post 3D upgrade is in question. Q: Can everyone see 3D? A: No. According to the College of Optometrists, approximately 5-10% of the population has stereo blindness. That segment of the population can’t see 3D images. If you have stereo blindness you can still watch 3D programming, unfortunately, it will only be perceived in 2D. If you have stereo blindness and watch 3D you may experience headaches and/or your eyes could feel tired. Q: Will I get a headache? A: Most people will not get headaches or eyestrain from watching 3D programming. 3D programming can cause headaches or strain after extended periods of watching. You eyes could feel tired. Q: Do I Have to Wear the 3D Glasses? A: Yes. If you watch without the glasses then you will see a blurry, unwatchable image. All who watch 3D must wear the 3D eyewear. Q: What equipment will I need to buy in addition to a 3D TV? A: For watching TV, a pair of active liquid crystal shutter glasses will be needed. Also, if you would like to watch Blu-ray movies, you will need to purchase 3D compatible equipment. A standard Blu-ray player will not play 3D Blu-rays. You will need a 3D Blu-ray player to se 3D images.The stand alone exception is Sony’s Playstation 3. By the end of 2010 Sony will release a firmware upgrade allowing users to play 3D Blu-ray discs and games in 3D. Q: Is a 3D Movie in the Theater the Same as a 3D Movie at Home? A: The technology is similar with two major differences, the size of the screen projecting the images and the glasses. In the theater the images are very large and don’t require the same active liquid crystal shutter glasses that you need in a home setting. It’s necessary to sit closer to the TV than you would to a screen in a theater. Previous Previous post: Epson PowerLite Home Cinema Projector. Next Next post: What is HDMI.